Schlock-Wire: Full Specs For The Blue Underground Blu-Ray Reissue Of CAT O’ NINE TAILS – Schlockmania! The Picture That Out-Psychoed PSYCHO! When a simple robbery at a research institute leads to a series of brutal murders, a blind puzzle maker (Academy Award® winner Karl Malden of A STREETCAR NAMED DESIRE) and a tenacious reporter (James Franciscus of BENEATH THE PLANET OF THE APES) begin their own investigation of the crimes. With nine different clues to follow, they uncover a shocking web of twisted genetics and dark sexual secrets that will finally lead them to a shattering climax of violence and suspense. 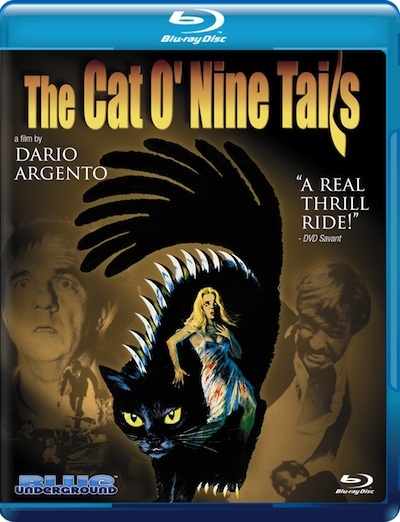 Originally released in 1971, THE CAT O’NINE TAILS secured the international reputation of director Dario Argento as ‘The Italian Hitchcock.’ This is the definitive version of Argento’s masterful second film, presented completely uncut and uncensored in a brand-new High Definition transfer from its original camera negative!